The digital universal measuring device PEM735 is suited for measuring and displaying electrical quantities of electricity networks. 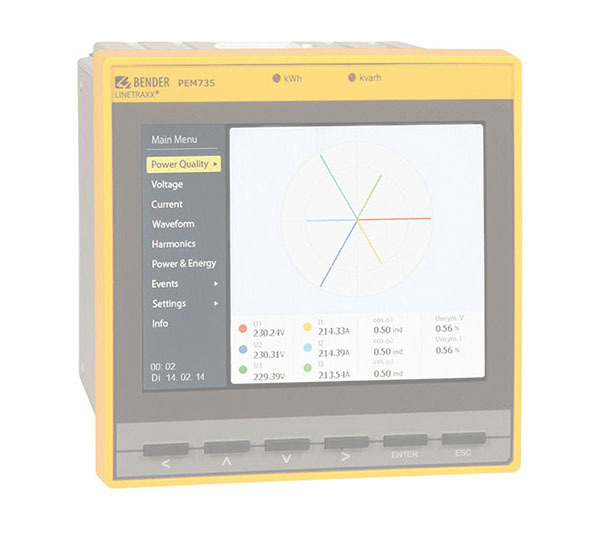 The device measures currents and voltages, energy consumption and power, and displays the individual current/voltage harmonics for assessment of the power quality in accordance with DIN EN 50160. The accuracy of active energy measurements corresponds to class 0.2 S in accordance with DIN EN 62053-22 (VDE 0418 part 3-22). The current inputs are connected via external …/1 A or …/5 A measuring current transformers.